At the Grumeti Tented Camp in the Serengeti, we usually gathered at the open air lounge before first light for a cup of coffee and a rusk or muffin. This was a traditional meeting to work out where to go for the morning and discuss what we hoped to see. There were very few vehicles in this part of the Serengeti in mid-September which meant there were few eyes searching for the wildlife we were hoping to see. Much of the wildlife moves at night so there is no guarantee that what you saw at last light the evening before you will see at first light the next morning. Nevertheless, it was a fun exercise to find out what each one of us wanted to see. The intriguing part of this exercise was that if you were absolutely precise about what you wanted to see, it was uncanny how often that is what revealed itself, not always but often enough to keep the mystery alive. 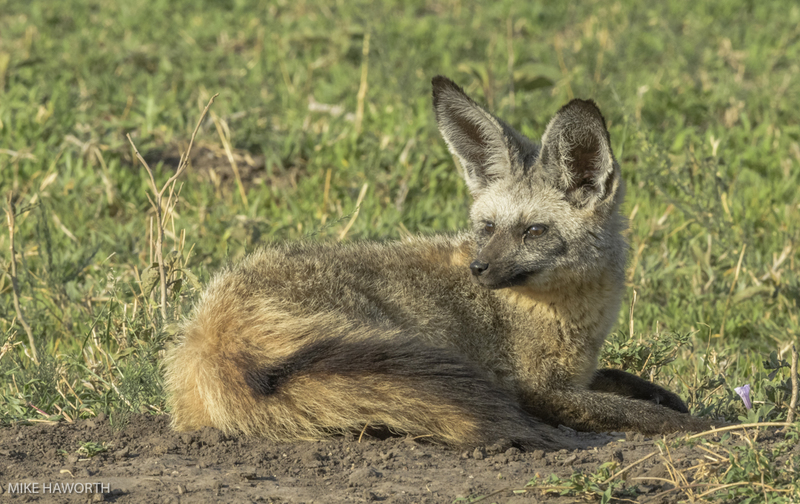 I had seen one Bat-eared Fox in the Masai Mara a few years ago, so asked whether there were Bat-eared Foxes in the Serengeti. Our guide, Yona assured us that they were around, but were not common so we would be lucky to see one or a family of them. 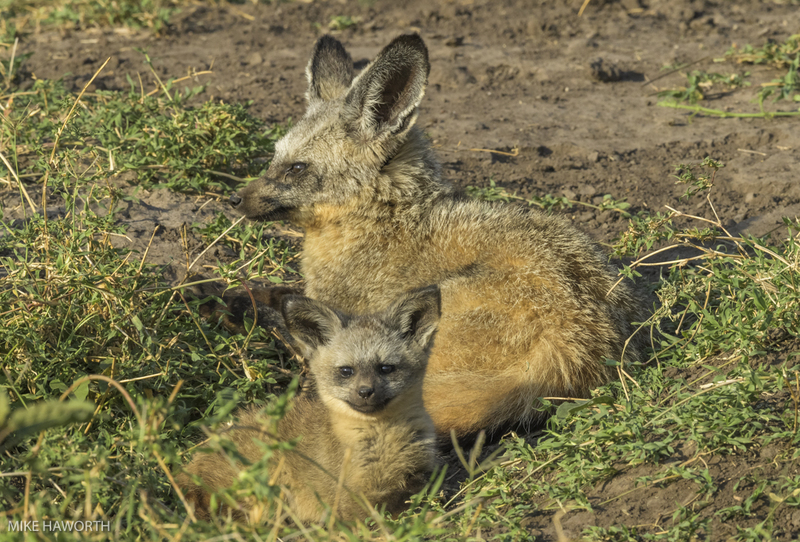 Guess what we saw that morning, our first Bat-eared Fox family. 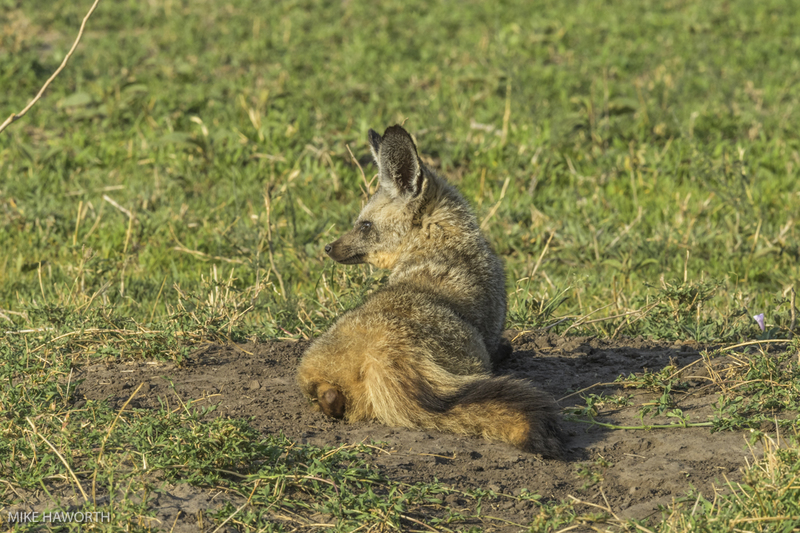 It was only when we ventured south toward the Nyasirira plains that we found a family of Bat-eared Foxes. On this particular morning it was cold and the wind was blowing hard. The two adults were above ground lying in the open just in front of their den. 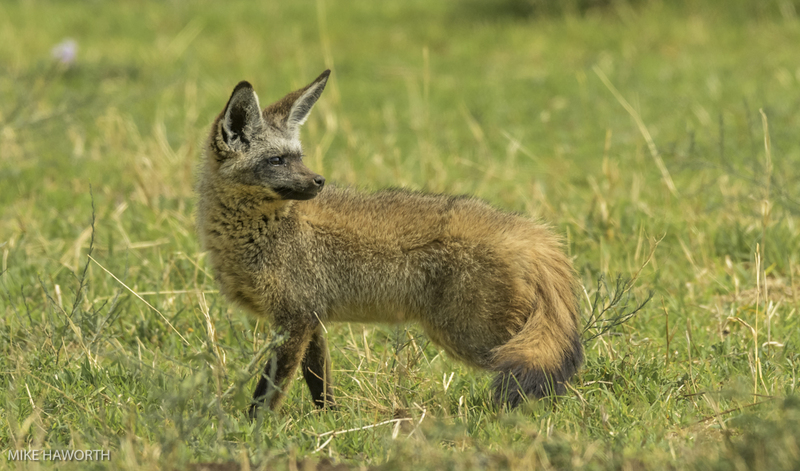 There are two distinct populations of Bat-eared Foxes in Africa, one that lives from Ethiopia to Tanzania and the other in southern Africa. 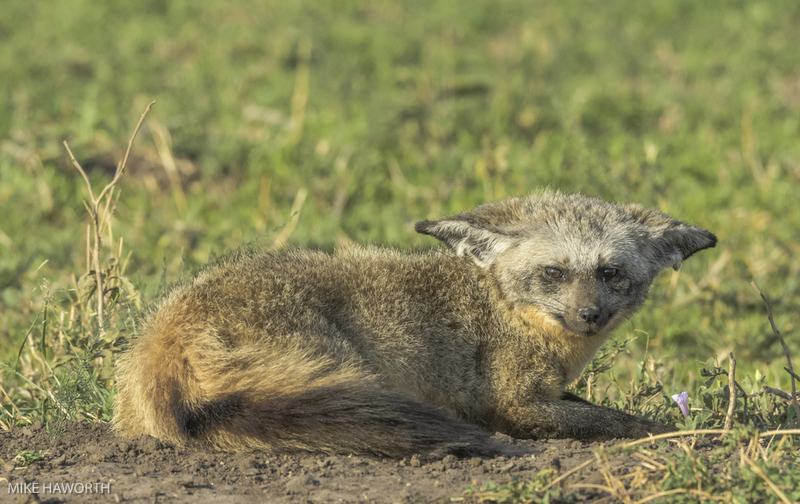 The Bat-eared Fox is so named because of its distinctive bat-wing shaped ears. Its latin name is Octoyon megalotis where the second word in the name comes from ‘mega’ meaning large and ‘otus’ meaning ears. 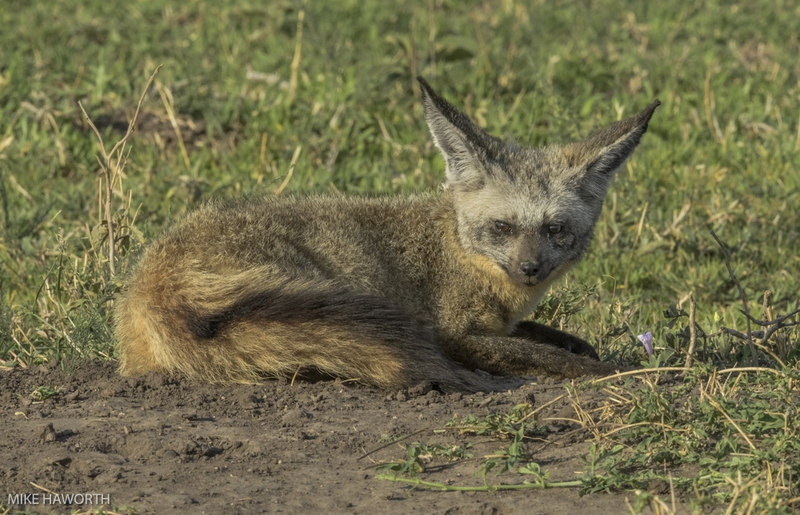 As you can imagine with large ears like this, the Bat-eared Fox has a hard time when the wind is blowing hard. The sound of the wind must be like a roaring its ears, so it flattens them. We found the den on a rise out in the open plain with hyaena, antelope and buffaloes all around. These are not big canids. The male is around 55cm in length and has ears about 13 cms long. 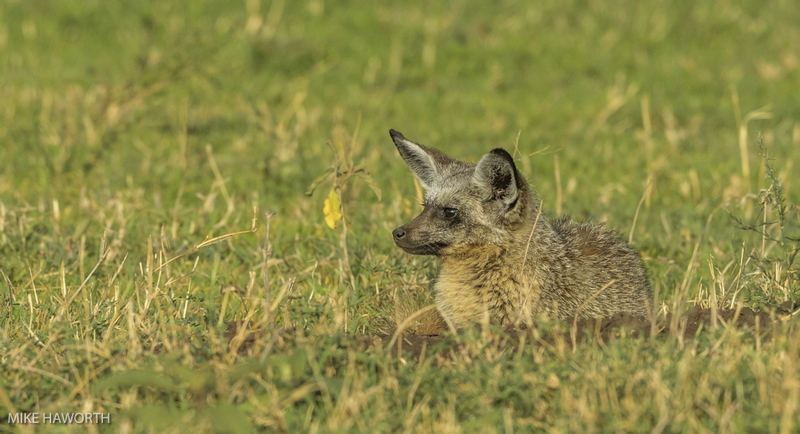 Bat-eared Foxes are mainly insect eaters so do not compete with the larger carnivores, but that does not stop the large predators killing them if they get half a chance. The other termite eaters are aardwolves, antbears and pangolins. Surviving on an all-insect diet required several adaptations which are found in the Bat-eared Fox. Firstly, their large ears provide acute hearing which enables them to hear insects such as dung beetles and termites under ground and in the thick grass. 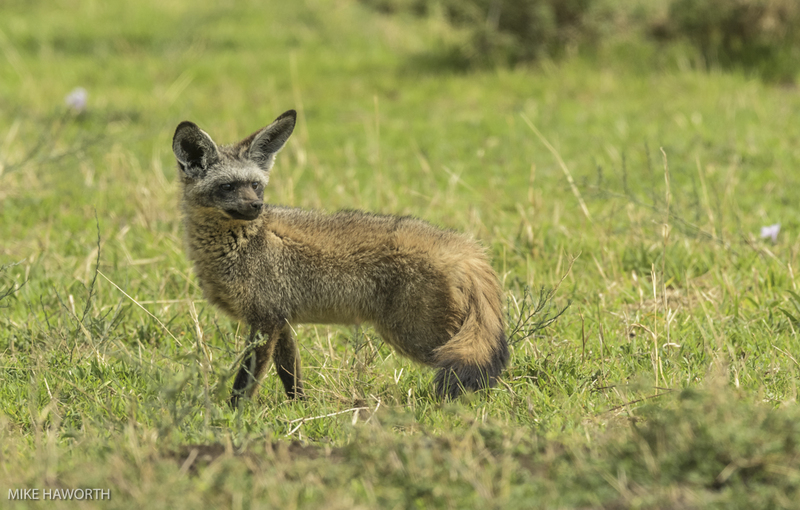 Bat-eared Foxes also have specialised extra teeth for shearing when chewing on insects, and their lower jawbone is designed to open and close rapidly. Apart from pure survival, the fox adults were especially wary because they had two cubs. 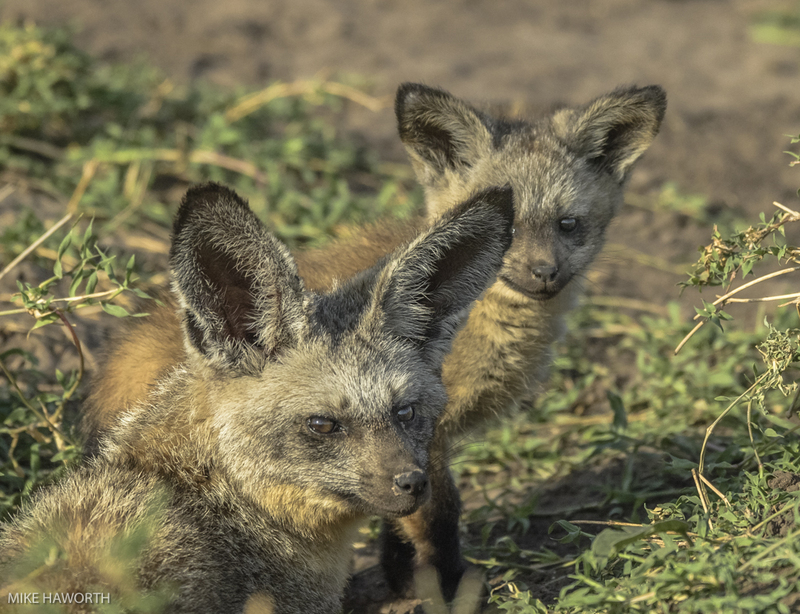 Bat-eared Foxes are socially monogamous and the male is actively involved in looking after the cubs once they are weaned off their mother’s milk. The cubs clearly knew the rules and disappeared underground on cue from the adults, but as youngsters they were overwhelmingly curious and wanted to see what this thing was that was looking at them. The thing being our photographic vehicle. Cubs are born after a gestation period of about two months and are weaned in a year. The cubs are born in underground dens, usually during spring or early summer. A Bat-eared Fox family has several den holes in its territory, each with many entrances, tunnels, and chambers. The foxes’ claws are made for digging, and they can create their own burrow or enlarge an empty one made by another animal. Outside the den, the fox adults are ever vigilant. 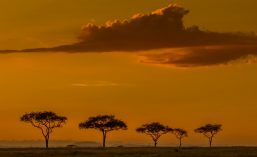 The short grasslands in the Serengeti seem to suit them and the position of the den on top of a rise in the middle of the plain gave them a good visual of a large area around them. 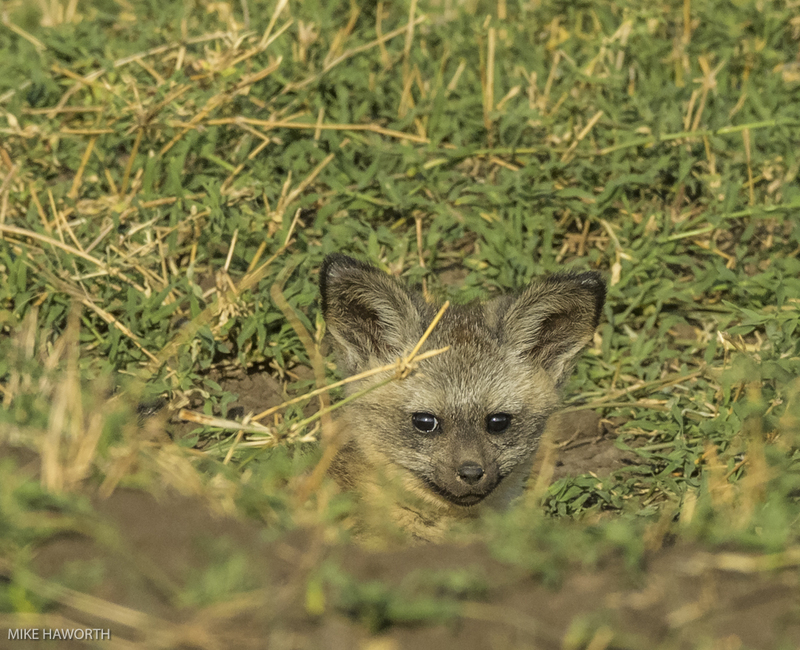 Termites make up around 80 percent of their diet and there are many termite mounds on the plains of the Serengeti, so I am a little surprised we did not see more Bat-eared Foxes. You can imagine that those large ears are like radar antenna and will pick up the slightest sound anywhere near. They locate their prey through their acute hearing. 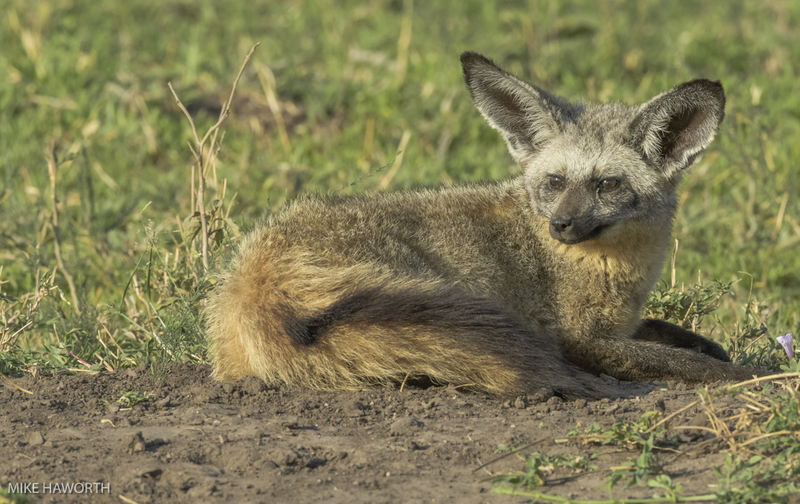 Bat-eared Foxes hunt in groups of two or three with hearing being their main sensory function. Just looking at their faces, their muzzle is small. The teeth of the Bat-eared Fox are much smaller and structured in shearing surface formation, different to other canid species. This is an adaptation to its insectivorous diet. Hunting for food is mainly diurnal, during sunrise and sunset. In the more northern areas of its range (around Serengeti), they are nocturnal 85 percent of the time. However, around South Africa, they are nocturnal only in the summer and diurnal during the winter. It was interesting to see the fox adults quickly picked up on a Black-backed Jackal wandering in the direction of their den. 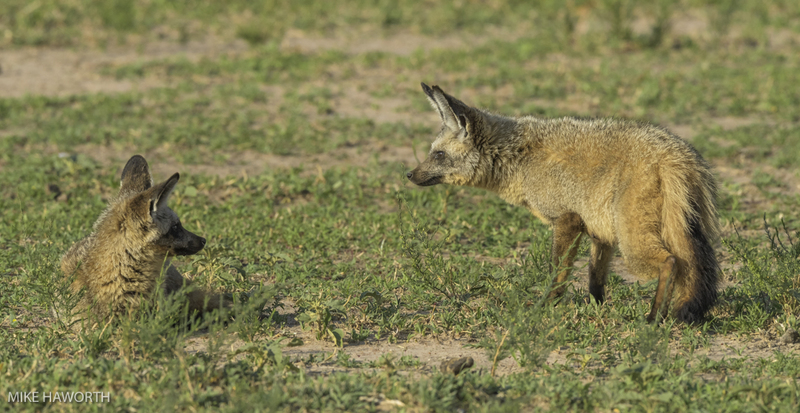 Immediately the male Bat-eared Fox stood up and stared directly at the Jackal. Visual displays are an active form of communication. 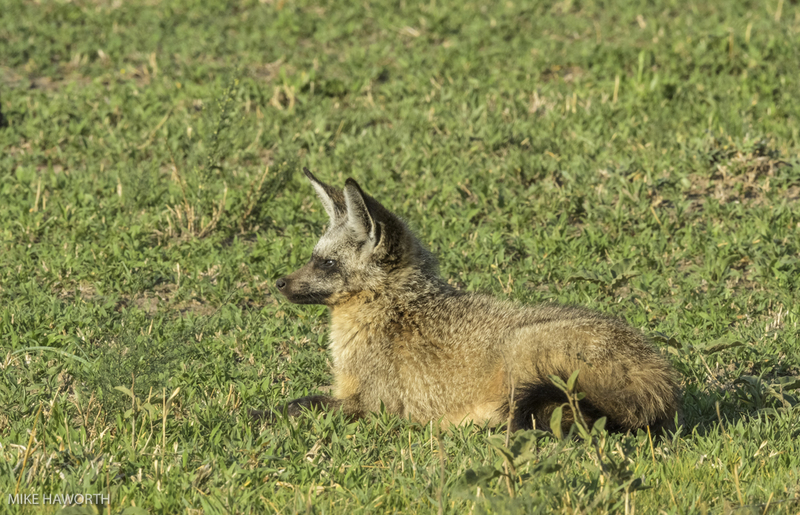 Only when the jackal continued to walk closer did the male Bat-eared Fox arch his back in a threat posture, with the female behind him lying on the ground with her ears flattened. When this threatening display did not work, the pair of fox adults ran toward the jackal in unison. The jackal decided this was not going to end well so detoured around the foxes den. 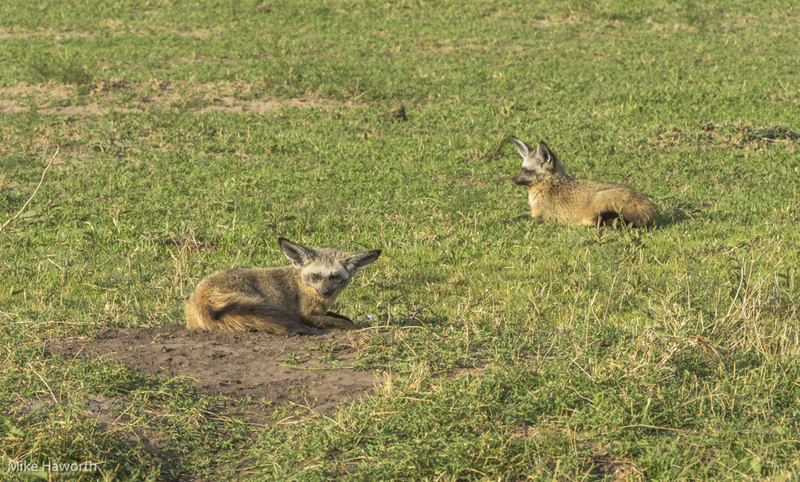 This Bat-eared Fox family had their den about a kilometre from water. They seldom drink water as they obtain most of their moisture from their food. Threats to these small canids are disease and floods (when caught in their dens) while the more immediate threats come from larger carnivores such as lions, leopards, hyaenas, cheetahs and African wild dogs. They are among my favourite animals. Yes Ann, they are fascinating – another thread in the wonderful tapestry of wildlife!